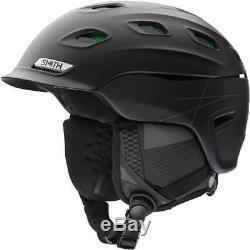 Smith Vantage Snow Helmet (Matte Black/X-Large). Dual regulator adjustable climate control. Adjustable Boa FS360 fit system. The Smith Vantage Snow Helmet is built for the hard-core individual who demands the ultimate on the slopes. Using Smith's Aerocore construction that features Koroyd, it simultaneously maximizes full coverage protection and increased airflow. For optimal head protection and a low profile fit, the build of the Smith Vantage Snow Helmet employs separate lightweight and durable shells. By fusing its tough Bombshell ABS construction with flyweight In-Mold technology, Smith's Hybrid Shell construction optimizes the favorable traits of each material in this revolutionary process. Featuring Smith's Aerocore construction, the Smith Vantage Snow Helmet is purposely designed to increase airflow and improve temperature regulation. Incorporated into its design is Koroyd, a revolutionary breathable material that absorbs more energy upon impact and increases airflow compared to international standards. Smith's Dual Regulator ventilation system independently controls the front and rear sections of the Vantage venting. This allows you to modulate your body temperature even in extremely cold conditions. By exhausting heat through the rear vents while maintaining a sealed front end, your body can effectively cool down if needed. Airflow ventilation utilizes strategically placed vents for easy climate control in all conditions. 21 strategically places vents maximize airflow and heat exhaustion in warm temperatures while minimizing undesired cold air drafts. Adjustable Boa FS360 Fit System. Smith's Boa FS360 Fit System features an intuitive dial system that enables on-the-fly micro-adjustability. With a full 360 degree halo design, this system offers wearers both forward and lateral fit adjustments. The fit system snugs to the head in a full halo, allowing for a "floating" effect that eliminates helmet hot spots. The Smith Vantage Snow Helmet is designed to work with goggles as a fully integrated system. The helmet's AirEvac 2 ventilation system drives the warm air away from the goggle through external vents and internal channels in the EPS liner. Smith SL2 ear pads consist of an inner surface of technical materials for comfortable seal from wind and cold weather. During warmer climates in the spring, you can remove the ear pads to reduce weight and maximize cooling of the helmet. What's in the Box. Skullcandy audio systems available: Yes. F There are product categories which are not returnable due to hygienic or sanitary as required by manufacturers. In an event where there is an error regarding a price error or description, we will notify you ASAP. Items removed from their'blister-pack' display packaging are non-refundable. The item "Smith Optics Vantage Snow Sports Helmet Matte Black XL" is in sale since Wednesday, September 5, 2018. This item is in the category "Sporting Goods\Winter Sports\Clothing\Protective Gear". The seller is "asavings" and is located in Brooklyn, New York. This item can be shipped to United States, Canada, United Kingdom, China, Mexico, Germany, Japan, Brazil, France, Australia, Denmark, Romania, Slovakia, Bulgaria, Czech republic, Finland, Hungary, Latvia, Lithuania, Malta, Estonia, Greece, Portugal, Cyprus, Slovenia, Sweden, South Korea, Indonesia, Taiwan, South africa, Thailand, Belgium, Hong Kong, Ireland, Netherlands, Poland, Spain, Italy, Austria, Bahamas, Israel, New Zealand, Philippines, Singapore, Switzerland, Norway, Saudi arabia, Ukraine, United arab emirates, Qatar, Kuwait, Bahrain, Croatia, Chile, Colombia, Costa rica, Dominican republic, Panama, Trinidad and tobago, Guatemala, El salvador, Honduras, Jamaica, Viet nam.